As always, Thursday is GURPSDay! But I missed a day, so here you go. Today marks a slightly new phase in how GURPSDay is presented, to make sure every post gets caught. I’ll be going back THREE weeks each report, rather than one. So posts will get some repeat views and if you miss one script pull, you’ll get two more chances. 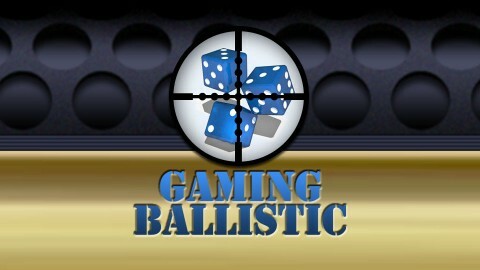 In big news for Gaming Ballistic, we’re entering the fulfillment phase of several projects. I can happily report that the international copies of Lost Hall of Tyr (2nd Edition) have finally arrived at the fulfillment center, after many trials and tribulations with the printer. 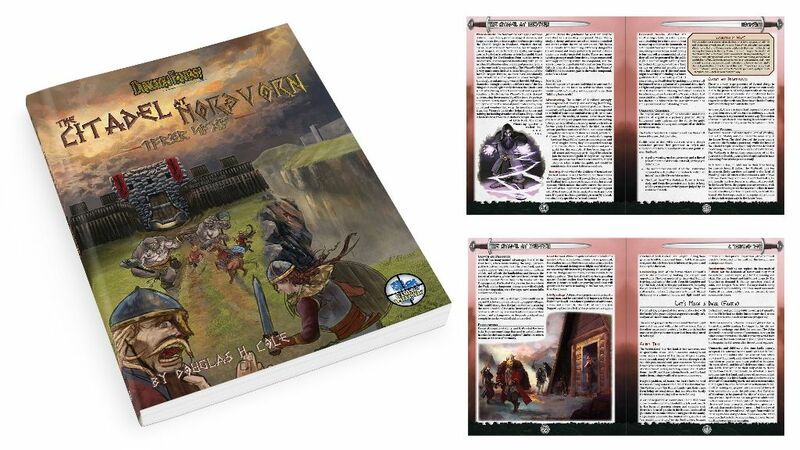 Citadel at Nordvorn goes into PDF delivery mode over the next few days as well, with Fantastic Dungeon Grappling going out today, and Hall of Judgment (2nd Edition) following shortly thereafter. Pretty much all the “already done” PDFs should be headed out to backers by the end of the weekend . . . and I’m doing my level best to have a readable, as complete as possible PDF of Nordvorn Monday or Tuesday. GURPSDay is starting its sixth – GURPSDay started in February 2013, a year after I started Gaming Ballistic. Things have slowed down a bit, and I’ll be considering how to revitalize this weekly activity. I’d like to see an average of 100 posts here per week – one per blog, ish – so we’ll see what we can do to get creative juiced flowing. The process to finish up Citadel at Nordvorn enters the fulfillment phase today! While the main document isn’t yet ready, PDFs of Fantastic Dungeon Grappling and Hall of Judgment will be finalized, updated, and distributed in PDF form over the weekend. Read on for details! And if you missed the campaign, it’s definitely not too late! Pre-orders are being taken on Backerkit right now, and will continue to be taken there until the print order is submitted the first week in May! Check out the update history on Kickstarter, or see any other Nordvorn info here on Gaming Ballistic! So, today is the day! I have locked everyone’s responses who have actually responded. That leaves 29 surveys incomplete, and (most importantly) 11 people who have physical product but have not completed the survey, and updated an address. I can’t send you your physical goods without a shipping address! Most – in fact, all but 10 – of the successfully-locked orders have also had your cards charged. That’s 566 people . . . woot! If you’re one of the 10, you’ll get an email from Backerkit to look into it. 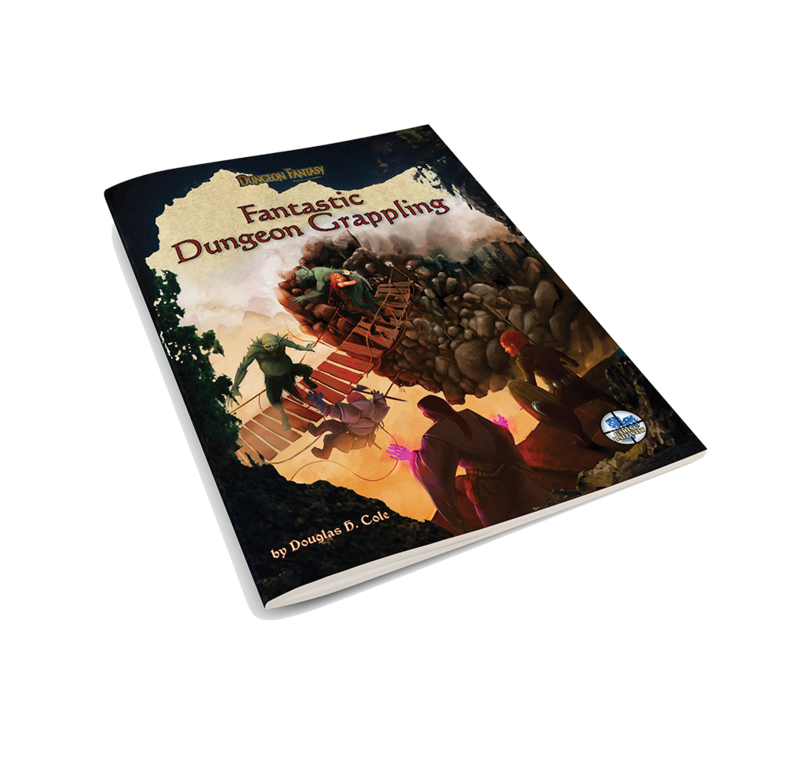 First Distribution: Fantastic Dungeon Grappling! I’m still working on Norðvorn . . . but anyone who ordered Fantastic Dungeon Grappling will be seeing a note from me later today with the PDF in their email box. I will then try and quickly clean up Hall of Judgment, and get that ready to print. Again, that’ll be in the next day or two. So that begins the fulfillment phase. When all the initial PDFs are out, I’ll take corrections and errata for a week or so, get the finalization, and then print! I’ll also be getting the bookmarks ready. Those are a separate print job, but not to worry. The good news is I got my UK VAT number, which means I can now import and distribute things for International folks per my original plan. That was a wrinkle, but one that’s been smoothed. It impacted my prior Lost Hall of Tyr (2nd Edition) final phase more than y’all. But those books ship – after many trials and tribulations – this coming Tuesday! I will be moving to finalize an order with my printer ASAP, and get things moving. It takes two weeks to order the paper . . . and I’m using the same paper throughout. That means the paper should be in hand May 6, so if I can get final files to them May 3, that satisfies the “no hiccups, no delays” staging. I will be attempting to get finals to them a few days earlier, but that’s where we stand. Over Apr 6-7, I went down to FNORDCon, Steve Jackson Games’ first gaming convention that they planned and ran themselves. Originally, there wasn’t going to be any GURPS/DFRPG content at all – maybe not even any roleplaying – but I and one of my authors, also a MiB, volunteered to fix that right up. He was going to run two sessions of his upcoming The Dragons of Rosgarth, while I’d do one session each of Hall of Judgment and one of the almost-ready Citadel at Nordvorn. Both sessions of mine were really, really full. I have a bit of a policy that if you come to one of my games, you play in one of my games. Especially with so few opportunities for RPGing while there. So both games had 12-13 folks in them. I’ll be reaching out to my other players tonight, and we’ll see if anyone else has thoughts. If you like what you read below . . . preorders for Citadel at Nordvorn are open! My background going in: Backed Dungeon Fantasy Monsters II and backed the Citadel of Nordvorn based on recommendation from there. I am very familiar, if rusty, with GURPS, and own Dungeon Fantasy but hadn’t played it in a group yet. My wife has played several D&D campaigns but has only played GURPS once. First of all, congratulations on running a session with 12 people that actually got stuff done! It’s really easy to get bogged down in details in DF and GURPS, and my wife appreciated the “GURPS super light” approach you took. You also were able to consistently answer our basic rule questions off the top of your head, which kept the pacing fast. Similarly, starting with “you’re all together on a boat, which is being attacked by another boat” successfully got us into the action right away without needing to reach a consensus first. The discussion afterward about what to do with our brand-new boat was hilarious! Next, the setting rocked! We were the two Minnesotan expats in the room, and even though we may not have actually encountered the Minnesota/Iron Range references during this session, knowing they were in there got us pumped! The time you spent storytelling, describing the setting and why people acted as they did, was just as entertaining as the time we spent as characters in-game. This also paid off in the story hooks; hearing the story of the lady whose father shamed her suitor in public legitimately pissed us off! I’m going to have to run this setting just to find out what the hell is happening there! We very much enjoyed the pre-made characters, my wife the “mace to the face” cat folk and me the halfling scout. I was worried that as two odd-ball characters we might miss out on some of the Norseness, but no, we were fully included! The descriptions and design notes were fun to read and helped us both jump into these characters immediately. Minor character highlight was the great big lady wrestler who showed off what the Fantastic Dungeon Grappling can do. Sold me on checking it out, that’s for sure. The Warding Temple quest to defend the village against 12 hobbs and 3 trolls was a mixed success. It succeeded in reuniting the party after we went a few different ways in Nordvorn, and ending on a big fight was a satisfying wrap-up so I’m glad we went there, but I got confused on where our party started in relation to the fey (ironic since I was the scout! ), and that made it tough to sort out what to do other than just “shoot” or “run up and hit/bodyslam them”. Maybe a simple “who’s charging in and who’s staying back” table on the giant notepad would have helped? Fortunately the spellcaster next to me concussed the snot out of half the bad guys (and a few of us too) which helped us win the fight and end on time. One last highlight: we arrived at the dock of Nordvorn with that brand new ship and the official asked us where we got it. We were standing around hum-hawing because, although per custom we’d claimed it fair and square, we weren’t sure exactly how to explain it. Suddenly you as our NPC boat captain whom we’d saved jumped in with “LET ME TELL YOU THE STORY!” It was an awesome moment of GMing and got us through that awkward pause while making us feel like righteous Norse heroes. In conclusion, this was a tremendously exciting setting and session. Thanks for running it! As always, Thursday is GURPSDay! I’ve got a tonne of stuff going on for me. Citadel just hit page count and fixed a ton of formatting stuff. Art is coming in. And we’re over 90% on backerkit. And in much less than a month, I’ll be getting ready for a new project for The Fantasy Trip. But for now . . . time to celebrate this week in GURPS. When all was said and done, when the campaign ended on March 24, we’d done very, very well. 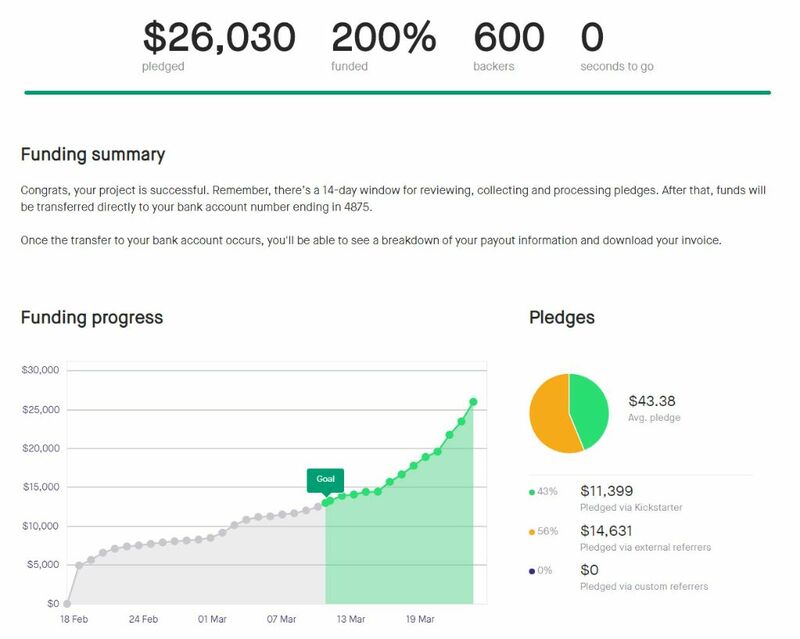 200% funding, a new-record 600 backers, and also a new-record (for me) $26,000. Officially my best campaign ever. If you missed the campaign, or chose to wait until it was certain to fund, it’s not too late to jump in. After some mis-steps with shipping, we got it figured out. I’m doing a print run of Citadel, Hall of Judgment, and the new Fantastic Dungeon Grappling in Latvia. That means for international backers, shipping will come out of the UK, at a greatly-reduced price relative to out-of-the-USA shipping. So if you held off physical product because of usually-egregious shipping fees, you might want to check things out. The book is looking to be very pretty. The interior art is coming in, with five or six finished pieces and a whole lot more underway: 42 commissioned pieces of art for the book, plus some stock art from the always-amazing Dean Spencer where it made sense. The text of the book – with one exception – has been written and edited and inserted into the layout. There is one page of text I need to finish up – that’s on tap for today, actually – then to build the relationship map of characters and motivations that will help GMs navigate likely responses to events. I’ll be testing that out at FNORDCon. Yep! I’ll be headed down to Austin, TX this weekend to run Hall of Judgmentand Citadel one time each. My author Kyle Norton will be running the never-before-seen scenario The Dragons of Rosgarth as a playtest. That is the next adventure in the Nordlond series. If you’re there, try and check it out. He’s running it twice. As Citadel finishes up, with hardly a breath Gaming Ballistic will turn from the Dungeon Fantasy RPG to The Fantasy Trip. The Kickstarter for the first four of a planned 10-or-more set of adventures for TFT will be launching in May. In fact, pretty much the week after I send out the preliminary PDF to Backers, I’ll be generating the KS campaign sheet for TFT. The adventures themselves are already written! Four adventures, two each by David Pulver and the team of Christopher Rice and J. Edward Tremlett (both published TFT authors), which will release as four separately-packaged 16-page short scenarios. Each will feature a color cover, black-and-white interior to better fit with the overall aesthetic of the TFT game line, and as much pretty art as I can cram in there. The TFT fans have let it be known that hex counters for all monsters had better appear either in the game or as an add-on, so I’ll make sure that happens. That should Kickstart in late April or early May (in all honesty, probably early May), and run through May. Art an assembly should go quickly since the words are already done, so I’m hoping to have PDFs to backers by mid to late June. Printing will be rather later, depending on volume. I’ve got great ideas on how to bring this to fruition efficiently. Actually, no. Following TFT, The Dragons of Rosgarth will get its day, another adventure for the Dungeon Fantasy RPG. Then Forest’s End, the third planned Dungeon Fantasy RPG adventure for 2019. And after that, four more TFT scenarios! Nope. There are a few other things in the works that I’m not ready to talk about yet, but one of them I am. I’ve partnered with James Spahn, author of White Star, for a short Swords & Wizardry scenario set in a fantasy-Viking culture. 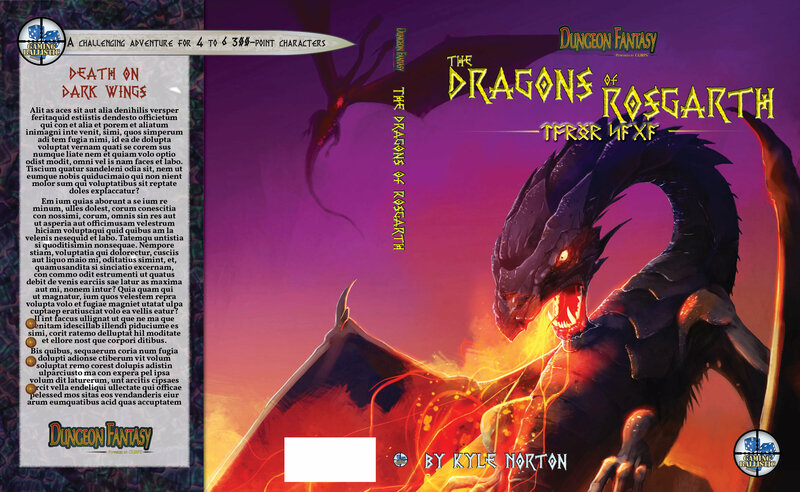 It will be 16-pages long, full color, and should convert nicely to Dragon Heresyand the Dungeon Fantasy RPG. Look for that at the end of the year! It’s shaping up to be an amazing, exhausting, thrilling year for Gaming Ballistic. I hope you all join me for the ride. Gaming Ballistic is off to FNORDCon! I’m headed out to FNORDCon today, back Sunday night. So I’ll be a bit thin on the ground here . . . but if you’re there, well, if there’s Dungeon Fantasy to be played, you’ll be playing it with either me or Kyle Norton. And two of those games are playtest sessions for the Dragons of Rosgarth . . . the next Norðlond adventure! Since the last GURPSDay (sorry I missed one), the Citadel at Nordvorn and DFM2/Boxed Set reprint both ended the primary campaign phase. Both funded solidly: DMF2 at just shy of $55K ($40K goal), while Nordvorn came in at $26K ($13K goal). Both funded and passed at least one stretch goal, and Citadel will be delivered as a sewn, lay-flat binding with 128 pages. A printing decision has been made, art is coming in, and the book is heading towards finalization. I turned in a finished PDF file to SJG to print Fantastic Dungeon Grappling to be inserted into the new reprint of the Boxed Set. So things are moving. In fact, The Citadel at Norðvorn is now accepting pre-orders via Backerkit. (In fact, things are going very well over there.) This should happen for the DFM2 campaign soon as well. Just to cover the back-story, this GURPSDay goes from mid-March to the present. The Citadel at Norðvorn: Pre-orders are open on Backerkit! The Citadel at Norðvorn completed a very successful Kickstarter campaign. It busted through several stretch goals including an increase to 128 pages and an offset, sewn-binding, lay-flat printing (that’s going to be so sweet, I’ll admit). Now, it’s time for the final phase of the effort: pre-orders and shipping. Check out the Kickstarter page for information on the book, previews of the art, progress updates, and the sweet add-ons and extra material available, including the 8-page Fantastic Dungeon Grappling. Then follow the pre-order link and jump in! Citadel campaign over. OK, what’s next? OK. Slept a bit. Not a lot. Spent most of the night having vivid nightmares about shipping. What’s that about? So, we’re done, we not just funded, but we busted a bunch of stretch goals! Including offset print! What the @#! !#@ is Offset Print? Here’s a link to a chat about the differences between digital and offset printing. The print quality for digital printing isn’t quite as good (mostly in color saturation and fidelity) to offset, which is why it’s better. And digital printing is (roughly) 1/3 the setup cost of offset, but 4x (!!) the per-copy cost. So for very short runs, digital wins. For runs usually in 1,000 copies or more, offset wins on both cost and quality. For the quote I just received, if I need to order 386 copies or more, it’s best to go offset. I need to order a minimum of 405 books . . . and Backerkit isn’t over . . . so that all works out nicely. There’s no question: it’s a pain. It’ll take me a few days to lock down the answer, too, because of course the books have to be printed first, then shipped from there to . . . somewhere. My strategy for trying to keep shipping costs down is evolving, but the offset print run promise means I must print one run, ideally overseas, so I can minimize international shipping. US-based offset, sewn printing just isn’t cost competitive (but it surely is time-competitive . . . there’s no better way to get 1,000 books from the US to the US in a 4-week deadline than some of the local printers here. These guys can be fast, and of course ground shipping inside the USA is a matter of days, not weeks or months like ocean freight). First thing: I need to finish the book. I made nice progress last night on finishing the Supporting Cast chapter, which is a list of NPC types that one will expect to encounter, plus a list of folks that were killed in the course of some of the background plot workings. Why focus so much time on a bunch of dead folks? Because they had friends and loved ones who are grieving, and need to blame somebody. That’s a powerful motivation, and animates a lot of activity. This still needs a lot of editing, but you can see what you’re going to see. After this, I’ve got a few pages of rules – mostly on social situations, which are deliberately given short shrift in the box set in favor of killing folks and taking their stuff – to write, and then whatever page count I have from where I am to 128 pages will be filled with critters. I’ve got placeholders so far, and I know I need to put in a bunch of dragonkin. Then we’ll see! Editing is catching up with writing very quickly, and Emily will soon find herself waiting for my latest chapter. That’s not ideal, because I prefer to be ahead of that, but it’s not bad, either, because it means that once I do hand over Supporting Cast, the monster chapter, and the additional rules text that I can simply start inserting her edited text into the book. Thus far, her edits have not caused any major problems with reflow – that’s a hazard of layout before editing is complete, but I’d rather iterate. Once all that is done, I go through and make the Table of Contents and the Index . . . and now that the KS is complete, I can compile the backer list for the “thanks!” page. So that’s all words. What about the pictures? I’m happy to report that the sketches continue to roll in. I’ve added new members to my art team, and I’ll be touting their qualities in future updates. What I can say is that the work I’ve seen so far validates my trust in these folks. Each artist brings their own talents, and what I’m finding is that all of them are able to take my art direction and approach it in ways that vastly improve the composition of each image. They’re really bringing Norðvorn and surrounds to life. What impresses me the most is how much they have done their homework. Getting “authentic Viking” right can be hard due to the amount of Hollywood-ized depictions out there, but one of my artists included a sword in her image that is a classic late-period Peterson Type X. Offset Print run: PILLAGED, by Oðinn! Son of a gun. We did it! So offset print it is. And with all of the Viking Raider pledges, I think I might need another batch of Hall of Judgment as well! I’m going to publish the update below to a bunch of RPG sites. If folks want to come by (or post on your own!) and do a bit of a victory dance, I would not object a tiny bit. Thanks for everyone who’s jumped in so vigorously. Even beyond that, this is nearly 50% more funding than Hall of Judgment, and that only had 525 backers. Let’s go rile up some folk! The Kickstarter for the Powered-by-GURPS licensed adventure, The Citadel at Norðvorn, is in its final three hours. We just passed the stretch goal that includes an offset print run, which will see the book with a sewn, lay-flat binding and printed on 100-105# matte paper. In the icy north of the realm, the dwarf-hewn fortress of Norðvörn anchors the defenses that ward against the predation of dragonkin and faerie alike. Three generations of relative quiet in the region have lulled the northerners and their defenders into a sense of stable peace. That is about to change. Norðvorn needs your help. The Citadel at Norðvorn is a licensed setting for the Dungeon Fantasy RPG. It consists of three major settlements, many small villages, at least one ruin, and two primary sources of conflict: The Hunted Lands to the northwest of The Palisade, and the Endalaus Forest, to the north and east of Audreyn’s Wall. Plus the lure of the endless wealth and magical treasure still lost in the Dragongrounds. Detailed descriptions of Norðvorn and two important towns. Important locations and personalities. Culture and festivals. Places to live and shop. Motivations and goals for key factions: the Wardens of Norðvorn, Faerie, Dragonkin, and foul fiends from Muspelheim and their human servitors. The ruins of Elskadr, whose destruction woke threats from the dragonkin, and mystical forces long dormant. Key NPCs and supporting cast, a bestiary, and an “instant village generator” for travel between towns. This setting is easily portable to any game world needing a “wild Northmen” feel. So go visit Norðvorn: Chaos is waiting for you. The Citadel at Nordvorn funded over a week ago, and just passed it’s major stretch goal to deliver the offset print run! Back it now and push it farther! If you missed the prior work, Hall of Judgment, there’s a “Viking Raider” level starting at $65 that also includes that book. There’s also “Fantastic Dungeon Grappling” and other goodness on there.